Signed E9 project with Customer E in 2013, inkjet print head analyze. Signed I8 project with Customer J in 2013, print head design, 720 x2 dpi. Signed I3 project with Customer C in 2012, print head design, 600 dpi. Signed I5 project with Customer J in 2011, print head design, 300 dpi. Signed EP project with Customer E in 2011, inkjet print head analyze. Signed MP project with Customer J in 2011, print head design, 300 dpi. Signed D2 project with Customer E in 2011, inkjet print head analyze. Joined Asus Group in April, 2004. Copyright© 2014 IUT. All right reserved. 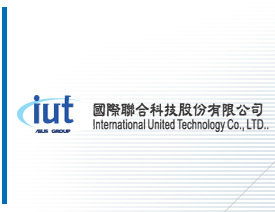 Tel:886-3-553-9199 Fax:886-3-553-9299 Sales e-mail: sales@iut.com.tw No.921,Po Ai St.,Chupei,Hsinchu,Taiwan 302,R.O.C.